Our Blog has moved ! New regulation on proof of origin requirement for textiles and clothing products has been adopted for EU countries. Åland Andorra Armenia Austria Bosnia and Herzegovina* Croatia Cyprus Finland Germany* Greece Greenland Holy See (Vatican City) Iraq Italy Lebanon Liechtenstein Montenegro Poland Puerto Rico Russia San Marino Slovakia Spain Sweden Switzerland* Uruguay* Virgin Islands, U.S.
*Represents regional holiday which might not be applicable to the entire country/territory. We hope that you find this information useful, and should you require further details, please give us a call. With the sad passing of Tamil Nadu region chief minister Jayalalithaa, Royale International advises all customers that the Indian state will conduct 3 days of official mourning with immediate effect. All Time Critical services to and from Chennai (MAA) will be suspended during this time. Should you have any urgent requests for India please reach out to the Global Time critical team for advice. The Indian Government has overnight, and without any prior warning, removed the INR500 and INR1000 currency banknotes from circulation. All banks are also closed today 09th November in India and ATM machines are not dispensing cash nationwide. As such, there are extreme limitations on the availability of cash in India at the present time. As cash is the most commonly utilised payment method in the country this may have consequences for excess baggage payments to airlines on export shipments via Handcarry mode. Import shipments are not affected. As such, if any of our client base are expecting to have upcoming Handcarry exports from India please try to provide us with as much prior notice as possible in order to prepare accordingly. 24th Nov American Samoa Guam India* India* Micronesia* Myanmar (formerly Burma) Northern Mariana Islands Oman Palau Puerto Rico USA (United States) Virgin Islands, U.S.
* Represents regional holiday which might not be applicable to the entire country/territory. 10th Oct American Samoa Argentina Austria* Belize Canada Chile Cuba Curaçao Fiji Hong Kong India* Japan Macau* Macau* Nepal Norfolk Island North Korea Northern Mariana Islands Puerto Rico* Samoa Sint Maarten Suriname Taiwan Tokelau Turks and Caicos Islands Uruguay* USA (United States)* Virgin Islands, U.S.
5th Sep American Samoa Bermuda Bulgaria Canada Guam India* Luxembourg* Northern Mariana Islands Palau Puerto Rico* USA (United States) Virgin Islands, U.S.
Based on the updates from the Hong Kong Observatory (Click Here), Typhoon NIDA is projected to strike towards Hong Kong with the greatest impact on Tuesday (02 Aug 2016) morning. Based on the given weather forecast; foreseeable delay are predicted on regular collections and delivery services. Time critical service will be evaluate on a case-by-case basis, depending on the actual weather conditions. When the name of a country is followed by an asterisk (*), it means that the listed holiday is not a full national holiday. It may be regional or non-official or limited to certain religious and/or linguistic groups. We hope that you find this information useful, and should you require further details, please give us a call. Bangladesh* Belarus Côte d'Ivoire Egypt* Guinea India* Niger Qatar* Saudi Arabia* Turkey Virgin Islands, U.S. When the name of a country is followed by an asterisk (*), it means that the listed holiday is not a full national holiday. It may be regional or non-official or limited to certain religious and/or linguistic groups.We hope that you find this information useful, and should you require further details, please give us a call. American Samoa Anguilla Azerbaijan Colombia Gibraltar Guam Guernsey and Alderney Isle of Man Jersey Malaysia* Nicaragua* Nigeria Northern Mariana Islands Puerto Rico* Spain* Trinidad and Tobago Turks and Caicos Islands UK - England UK - Northern Ireland UK - Scotland UK - Wales UK (United Kingdom) USA (United States) Venezuela* Virgin Islands, U.S.
We would like to express our condolences for the people who lost lives in the disasters and offer our heartfelt sympathy for those affected by Kumamoto earthquake on 14 April. According to the U.S. Geological Survey, a major 8.1 magnitude quake strikes off at southwest coast of the Indonesian island of Sumatra on 2nd March, 2016. The epicentre was 808 km (502 miles) southwest of Padang, and was 10 km (six miles) deep. There were no immediate reports of damage or casualties. HONG KONG, 1 MARCH 2016 – Royale International Couriers Limited, a leading global logistics solutions provider, is pleased to announce that it has been awarded the ISO 9001:2008 Quality Management System certificate from BSI – a global ISO Certification Service Company. ISO 9001 is a quality management system, implementing a systematic and process driven approach to managing business. The ISO certification is based on quality management principles, including strong customer focus, motivation and implication of top management, a process approach to continual improvement and review. Being ISO certified means our customer base can remain confident of Royale International’s commitment to quality. Formed in 1901, BSI (British Standards Institution) is the world’s first National Standards Body and awarded its Royal Charter in 1929. Comprising over 3,000 staff, BSI works with over 80,000 clients every year in 172 countries worldwide helping its clients drive performance, reduce risk and grow sustainably. As one of the founding members of the International Organization for Standardization (ISO), BSI is responsible for originating many of the world’s most commonly used management systems standards and publishes over 2,700 standards annually. BSI is also independently assessed and accredited globally by ANAB (ANSI-ASQ National Accreditation Board) and by over 26 other accreditation bodies throughout the world including UKAS (United Kingdom Accreditation Service). BSI is also renowned for its consumer recognized BSI Kitemark™, which today ranks amongst the UK’s most trusted brands. For more information, please email BSI at hk@bsigroup.com or call +852 3149 3300. Andorra* Argentina* Argentina Azerbaijan Colombia Costa Rica Denmark East Timor* El Salvador Faroe Islands Finland* Greenland Guatemala Honduras Iceland India* Israel* Mexico* Nicaragua Northern Mariana Islands Norway Paraguay Peru Philippines Portugal* Spain Svalbard and Jan Mayen Sweden* Tajikistan Uruguay Venezuela Virgin Islands, U.S.
Due to protests in the state of Haryana, pick-up activities and shuttles arrivals are distrubed since Friday (19th Feb 2016). DEL LUD and DEL CHD shuttles are blocked by protesters on highways at DEL GTW . Cyclone Winston passed Fiji at around 01:00am on 21st Feb 2016 with extensive damage across Fiji. Suva has relatively minor damage compared to the rest of Fiji. Roads are blocked with fallen trees, power lines & damaged houses. The west coast of Viti Levu & the outer west islands hit worst with the storm's intensity peaking over Nadi. With power lost & repairing needs on infrastructures, significant delays are expected. Åland Andorra Armenia Austria Bosnia and Herzegovina* Croatia Cyprus Finland Germany* Greece Greenland Holy See (Vatican City) Iraq Italy Lebanon Liechtenstein Montenegro Poland Puerto Rico Russia San Marino Slovakia Spain Sweden Switzerland* Transdniestria Uruguay* Virgin Islands, U.S.
Chennai remained cut off from the rest of the India state for the second day due to the absence of road, rail and air traffic. The Chennai International Airport (MAA) has been flooded. According to the authorities the airport will remain closed until 6th December 2015 and the met office has said the next 48 hours will be crucial. Due to heavy rains, all deliveries and collections will be affected in the Chennai - Tamil Nadu . With flooding in certain areas, there might be loss of power supply, please call Sid - tel :+917299270000 or Prem - tel: +919841088889 for any urgent issues. Abkhazia American Samoa Cambodia Guam India* Micronesia* Northern Mariana Islands Oman Palau Puerto Rico USA (United States) Virgin Islands, U.S.
Amerikanischen, Samoa, Argentinien, Bahamas, Belize, Kambodscha ,Kanada, Chile, Kolumbien, Costa Rica, Fiji ,Guatemala*, Guinea, Aquatorial, Indien*, Indien* ,Japan, Mazedonie,n Norfolkinsel, Nordiche Marianen, Puerto Rico*, Samoa, Spanien ,Tokelau, Turks-und Caicosinseln, Uruguay* ,USA (United States)* ,Venezuela, Virgin Islands, U.S. The Royale International Group is a global market leader in the specialist time critical next flight out and hand-carry market for many of the world’s top Fortune 500 companies. We are happy to announce that we have become a member of the X2 Critical Network - a global logistics network of dynamic and independent specialists in the field of time critical logistics – representing international markets from around the world. Royale International is now the official and sole HKG vendor for Time Critical Service in the Hong Kong market. At Royale International, we make it our business to solve our clients’ logistical problems. This means understanding each customer’s unique needs and formulating the most efficient and appropriate solution – even if it means meeting a near-impossible deadline. Our one‐stop integrated solutions combine personalized local service with the advantages of our extensive global network. As a vital link in your supply chain, we know you rely on us to deliver exactly as promised – and we make it happen. Royale International operates a global network of "On Board Couriers" guaranteeing a safe and prompt arrival for your international shipments. We are committed to provide a quotation and flight routing within 30 minutes after the initial request. Once approved, our OBC expert is able to board on a flight together with the shipment as fast as 4 hours with all the documentation cleared & ready. Asia and the Middle East: Bangkok, Bangalore, Beijing, Busan, Chennai, Dhaka, Dongguan, Dubai, Fuzhou, Guangzhou, Hangzhou, Hong Kong, Hyderabad, Manila, Mumbai, New Delhi, Ningbo, Pune, Qingdao, Seoul, Singapore, Shanghai, Shantou, Shenzhen, Suzhou, Taipei, Tokyo and Xiamen. American Samoa Bermuda Brazil Canada Guam Luxembourg* Mozambique Northern Mariana Islands Palau Puerto Rico* Swaziland USA (United States) Virgin Islands, U.S.
American Samoa Belarus Guam* Marshall Islands Northern Mariana Islands* Virgin Islands, U.S.
American Samoa Brunei Guam Malaysia* Northern Mariana Islands Puerto Rico* Rwanda Tonga USA (United States) Virgin Islands, U.S.
As we at Royale International continue to improve our infrastructure and technology to better serve our clients, we would like to inform you in advance of some upcoming changes to our existing airwaybill system. An online airwaybill platform currently exists whereby customers can print airwaybills directly from our website. The system also allows you to save regularly used addresses therefore removing the need to handwrite information. This technology is already in place and being used by many of our customers. We are looking to have complete conversion to the online method for all customers by August 1st, 2015. If any customers are unsure on how to use the system we have provided a user guide - CLICK HERE and our sales representatives will be happy to demonstrate how to use the software. China will be on National Labour / Golden Week Holiday from 1st May to 3rd May 2015. Please see below general pick up/delivery schedule for your reference and note Royale China CS will be on duty during the holiday. Shanghai - Official holiday is 1st May to 3rd May. Customs will be closed from 1st May to 3rd May and there willbe no customs clearance during this period. Customs re-open on 4th May. Shenzhen - Official holiday is 1st May to 3rd May . Customs will be closed from 1st May to 3rd May and there will be no customs clearance during this period. Customs re-open on 4th May. Rest of China - Official holiday is 1st May to 3rd May. Customs will be closed from 1st May to 3rd May and there will be no customs clearance during this period. Customs re-open on 4th May. Hong Kong - Official holiday is 1st May . Customs will be open 24/7/365 as usual. Collections and deliveries will be made as required but note that all offices, shops and schools will be closed during the holiday. Taiwan - Official holiday is 1st May . Customs will be open 24/7/365 as usual. Collections and deliveries will be made as required but note that all offices, shops and schools will be closed during the holiday. Please contact Royale International CS or Operations should you have any special requests during the holiday period. Due to the APEC ( Asia-Pacific Economic Cooperation ) CEO Summit will be held in Beijing from 10th Nov to 11th Nov, the State Council has approved for a six-day holiday from 7th to 12th for government departments, institutions and organizations in Beijing city, as for private companies, it will be at their own discretion for the holiday arrangement. Beijing Customs and CIQ ( China Entry-Exit Inspection and Quarantine Bureau ) will be closed from 7th to 12th Nov. There will be no export and import clearance available at Beijing customs, except those AA grade credit enterprises, who are registered with customs for 365 days clearance, however anything requiring customs inspection or CIQ, it has to be held till 13th Nov.
For hand carry arrangement, we still haven’t received the notice from Beijing customs for their holiday arrangement, China hand carry team will update once we receive the information from Beijing customs. There will also be traffic control ( A traffic ban based on an odd-even license plate system ) from 3rd to 12th Nov in Beijing city, reducing the vehicle numbers on the road. All trucks and light goods vehicles will be restricted in Beijing city during this period, so please check with us for any pickup and delivery arrangement needed, delay will be expected. Thank you for your business with Royale International. Due to the further expansion, please be informed that we will move Shanghai Operation center to the following new address below, effective as of 25th Aug 2014. We look forward to your continued support. Should you have any queries, please feel free to contact us. Thank you for your business with Royale International. Due to the further expansion, please be informed that we will move Customer Service Department to the following new address below, effective as of 18th Aug 2014. All our contact information remains unchanged. Shall you have any concerns on the above, you are most welcomed to contact us at our hotlines. In order to prevent undeclared dangerous goods from being carried on board aircraft, you are reminded to exercise extra caution on cargo shipments described above or cargo with similar descriptions. The Dangerous Goods Office strongly urges airlines, handling agents and freight forwarders to seek confirmation from shippers and conduct random checks on such shipments. In case undeclared lithium battery is found, the consignment must not be accepted and the record rejecting such shipment shall be preserved for at least 6 months for inspection. Should you have any query about this circular, please contact Safety Officers (Dangerous Goods) at 2910 6981 or 2910 6982. Stay tune on our daily business tips and insights, we will continue to strive our best in providing our followers with the best services. Hong Kong (Friday, December, 2013) – The Royale International Group is proud to announced the opening of a new eight story warehouse operation in Shenzhen, China. Located close to its global and regional headquarter in Hong Kong, the Royale Logistic Center will be served as one of the major hub for its courier, warehousing and operation business in Asia Pacific. It provides up to 2,400 square meter of space for the expansion of storage and daily operations. Scott Morson, Regional General Manager of the Royale International Group added, “This investment demonstrates Royale's commitment to offer broad and innovative logistics solutions to its customers. By enhancing our offering through state-of-the art comprehensive logistics infrastructure, our customers can benefit from the broad range of logistical solutions, order fulfillment support and increased logistical and operational efficiencies. We have also placed a lot of effort into building our new Warehouse Management System (WMS) to provide a more user-friendly, customized and cost effective platform to cater to the specific needs of our customer and we foresee a continuous future investments to cope with the demand of the competitive Asia pacific market." Royale International Freight Forwarding Agency (Shenzhen) Ltd. The weekend of May 24-26 sees the return of the ever popular Hong Kong Soccer Sevens tournament hosted by the Hong Kong Football Club. As in previous years, Royale International are proud to be bringing over a star studded team from Nottingham Forest to participate in the veterans section under the guise of the Nottingham Forest Mobsters. This year the squad features ex-England international Des Walker and will be jointly managed by former England and Manchester Utd star Neil Webb. Also featuring is former Brentford FC captain and Welsh international, Paul Evans, and the prolific Nigerian International, Dele Adebola. Retail in Asia (RIA) asks Steve Nott, Director of Royale International Couriers Pty Ltd - Australia, how they see future growth and regional networking within the confines of a heavily taxed and regulated business environment and the continued strength of the Australian dollar. It was an early start on Sunday as four intrepid adventurers from Royale International gathered in Causeway Bay for the 0715am registration of the 2013 Outward Bound Adventure Race. The team comprised of John Fawcett, Dean Locke, Wayne Griffiths and Philip Murton, set off on the gun at 0800 on a 15.5km course that was undisclosed to competitors prior. Following blue ribbons placed along the route the race started with a run up to Tai Hang Road before heading into the foliage and climbing up a river gorge in Tai Tam Country Park. A tough ascent through the undergrowth was then followed by a sharp, slippery descent to the Tai Tam reservoir where an orienteering challenge was completed, aided by former orienteering county champion Fawcett. A further hour of clambering over rocks and running through storm drains saw the team emerge on the beach at Deepwater Bay. A challenging 5-legged-race challenge was then completed (4 competitors with legs strapped together!) before a run around the headland and a swim in the icy waters of the South China Sea across to Middle Island. On Middle Island we hopped into ocean kayaks to head over to South Bay with a brief interlude involving Murton clambering on board a yacht before having to walk the plank and dive 20 ft into the rather dirty waters off Repulse Bay. After making landfall at South Bay it was another long, arduous climb up the granite slopes before finally descending down into Stanley to see the welcome sight of the finish line. Our time was a remarkably impressive 5 hours and 5 minutes placing us well up the field. No serious injuries, multiple aches, pains, cuts and bruises but a terrific day in the sun. The event is to be held on March 10, 2013 and involves a one day 15 to 20 km adventure race in Hong Kong. The whole day starts at 7am and is planned to finish around 4pm ending in a prize presentation ceremony. Royale International is sponsored as one of the elite corporation teams and all money that is raised will be going towards supporting the underprivileged youth by subsidising Outward Bound Courses. We wish the entire team a lot of luck in completing this difficult but fun challenge in aid of Outward Bound. HKDC Mobsters Veterans team proudly sponsored by the Royale International Group were pleased to represent the company at the 99th Manila Nomads 7 a side Veterans Football Tournament held over the weekend 23-24th February. Sides from Germany, Australia, Thailand, Hong Kong, China, Singapore and The Philippines flocked to one of the oldest tournaments in SE Asia. On Saturday the Mobsters played 3 group matches in blistering heat. First up were the Howzat Oldies sponsors of the Tournament from Manila and the Mobsters ran out 5-1 winners gaining a very valuable bonus point for 4 goals scored, next came The Hong Kong Swiss who were dispatched 2-0. Third and final game of the day came ADB Manila who also went down 2-0. On Sunday the Mobsters faced fierce Hong Kong rivals Team Bondi. It was a tight fought game as the heat again bore down at + 85 . Neither team could break the deadlock and the game ended 0-0. Team Bondi’s joy at finishing second in the group was shortlived as on the other pitch Hong Kong Swiss scored a late goal to pip Team Bondi to second place. The Quarter-Final loomed and the Mobsters faced the Hosts The Manila Nomads. A very partisan crowd appeared as the Mobster dug deep and won 2-0. The Semi-Final against Beijing Real Ancient was in the balance until the last few minutes when two quick goals won the game for the Mobsters. The Final was against the only other unbeaten team in the tournament Dutch Boys United. This was an incredibly close game and only the skills of both Keepers especially the Mobsters Simon Maher kept the game goalless. The final whistle blew at 0-0 so a 4 minute Golden Goal Extra Time loomed but only 3 players could stay on the pitch. This also was a tight session but with only a few seconds remaining the Mobsters Matt Carr took the ball from the half way line and let loose with what can only be described as a thunderbolt into the top left of the goal, it was so fast it actually ripped a hole in the net, the Dutch Boys keeper left flailing at air. The Mobsters bench erupted and finally they were Champions again. The Mobsters Keeper Simon Maher was voted Goalkeeper of the Tournament, Andy Archer scored 7 goals but missed out on the Top Scorer award by one. It was a proud moment for all watching to see our Captain John Fawcett raise the Trophy. Many thanks to the Nomads for organizing again an absolute cracker of a tournament and the Mobsters are looking forward to defending their title at The Centenary tournament in 2014. Members of the Royale International Group had the opportunity to attend the Championship League game between Nottingham Forrest and Bolton Wanderers this year in the UK on 16th Feb, Saturday. The match was concluded with at 1-1. On the day of event, Mr. John Fawcett, Director & Principal of the Royale International Group was honored with a Sponsors Award by Nottingham Forrest Players present and past, Mr Andy Reid and Mr Nigel Jemson as an appreciation of the continuous support provided to Nottingham Forrest Football Club over the years, In addition, Nottingham Forrest and England International Neil Webb presented an autographed Bolton Wanders shirt to Mr. Michael Clarke as a memento of the Match. In 2011, Royale International Group’s Mr. Philip Murton and Mr. Michael Charlwood had participated in the strenuous and challenging event; The MoonTrekker (www.moontrekker.com), which involves a grueling 40km night race over the mountains of Lantau Island in Hong Kong with the goal of finishing before sunrise. The team had managed to raise over HK$4460.00 for the Room to Read charity (www.roomtoread.org). The MoonTrekker had funded the charity organization over 26 projects promoting and enabling education through programs focused on literacy and gender equality in education across South East Asia and Sri Lanka. This year, The MoonTrekker have extended the finish-line by a further 1.5km. Mr Philip Murton, Sales Manager from the Royale International Group continues his participation at the event aiming to beat last year’s record of 9 hours and 1 minute in this coming Friday, 19th Oct 2012. Taipei, Taiwan R.O.C , 03 Sept, 2012 – The Royale International Group has officially opened Royale International Inc, Taiwan in Taipei’s Da’an District today, to help provide local support services to Royale’s existing international clients and build a closer link between Taiwanese businesses with their one stop integrated courier solution that combines an extensive global network with personalised local service. Royale Taiwan will become one of the first courier companies in Taiwan to provide next day delivery courier services to key international destinations such as Amsterdam, China, Frankfurt, Hong Kong, Johannesburg, London, Melbourne, Sydney, and Paris from Taiwan. In addition to Next Day Delivery Service, they will offer International Courier Service, Time Critical Services, Next Flight Out (NFO) Service, Air Freight Services, Special Time Deliveries, Domestic Courier Service, and Warehouse, Logistics & Distribution Services. Royale International Group is one of the largest independent express companies in Asia and has been providing customized global express solutions to clients worldwide since 1980. We have offices around the world to ensure maximum efficiency and accessibility with our global & regional headquarters in Hong Kong. Royale International assists companies to improve their supply chain management by offering an in depth global knowledge and a 24/7 philosophy. Royale International Group, one of the largest independent global courier provider, today announced its support to the Legal League Hong Kong. Legal League Hong Kong was established in 1992 as a nonprofit organisation and is managed by a core, team-elected group of like-minded, passionate individuals. They also play with a social conscience and help support Hong Kong Dog Rescue (HKDR) - a charity dedicated to rescuing, rehabilitation and finding a loving home for abandoned and unwanted dogs. The Royale International Group is one of the largest independent express companies in Asia and has been providing customized global express solutions to clients worldwide since 1980. We have offices around the world to ensure maximum efficiency and accessibility with our regional headquarters in Hong Kong. Royale International Group assists companies to improve their supply chain management by offering an in depth global knowledge and a 24/7 philosophy. Created over 30 years ago and originally comprised of legal firms, The Legal League (as it is still called) has grown in popularity and now provides weekly, competitive football for 23 social teams. It's a truly international affair; comprising of like-minded local and overseas people who have chosen Hong Kong as their home. These players comprise of all age groups, every profession and are intrinsically linked by one common goal; to be part of a social, sports-minded movement. The 2012 London Olympics commence on July 27th and run through until August 12th. During this period multiple road closures, vehcile restrictions and traffic limitations are being strictly enforced across the city. This will result in delays to London deliveries and collections during this period. Traffic control measures are extensive and it is expected that 0900 special deliveries will be delayed during the games period as main roads into London are being reduced to single lane traffic only. Locations around event arenas are to be completely closed to traffic and designated as Lockdown Areas. A list of these locations and dates of lockdown are attached. Aside from this there will be severe traffic congestion city wide and a list of the main affected postcodes is also attached. Please contact our customer service department on 2318 0370 or cs@royaleinternational.com for any further questions. With effect from August 1st, 2012, Royale International will charge for formal customs entries into the United Kingdom. The charge will apply for any high value shipment with a declared invoice value above GBP15 or equivalent. The formal customs entry fee will be charged at HK$125 or GBP10 per entry depending on account billing currency. If you have any questions please contact our customer service department on cs@royaleinternational.com. All shipments to the United Kingdom MUST be accompanied by a detailed shipping invoice. The shipping invoice MUST include quantity and description of contents and MUST declare the contents at a realistic value. If samples, the declared value should be the true cost of production of the contents. If commercial goods, the declared value should be the true value of the goods being sold in the UK. Shipments with a declared invoice value of GBP15 or above are liable to Value Added Tax (VAT) in the United Kingdom. Shipments with a declared invoice value above GBP135 are liable to Value Added Tax (VAT) and Import Duty. Any shipment valued above GBP15 will be liable to a High Value UK Customs Entry which is charged to the consignee at a cost of GBP9 per airwaybill. Shipments will not be delivered until any due VAT or duty is paid in full by the consignee. Consignees in the UK are able to claim sample relief from VAT charges under the European Operator Registration and Identification (EORI) scheme. Consignees will be contacted to obtain their EORI numbers on day of shipment arrival for the purpose of the customs entry. If the consignee is not EORI registered then Royale International will advise them how to obtain EORI status, this application takes up to 48 hours so we advise all consignees to obtain EORI status in advance if not already registered. The Royale International Freight Forwarding Agency (Shenzhen) Ltd proudly supported this year’s Inter-Chamber Christmas Party 2011 held last week on Dec 8th, 2011, with 6 free international courier shipments to either one of UK, France or Germany destination. They kicked off the celebrations with 40 children from the British School Choir singing Christmas carols and continued into the night with songs from the famed Benoit jazz band and closing off with various lucky draws. Royale International Freight Forwarding Agency (Shenzhen) Ltd would like to congratulates all the winners and wish them all a Happy Holidays! Log on to the British Chamber of Commerce’s webpage to learn more about the event, please click here. Follow the Royale International Group on our , facebook, twitter, viadeo and/or linkedin. MoonTrekker 2011 came to a close on Saturday, 22 October 2011 with just under 900 participants raising over US$100,000.00 for the Room to Read charity. The trek was completed with the descent of Lantau Peak before sunrise under almost perfect weather conditions. They had a fantastic evening with a number of records and firsts for the MoonTrekker event. Royale International’s Mr. Phil Murton and Mr. Michael Charlwood had participated in the strenuous and challenging 40 km event and managed to raise over HK$4460.00 for the MoonTrekker 2011. “I am happy that we both survived and that we were able to contribute this meaningful event. This is definitely one of the most challenging things that I have ever done both physically and mentally. A big thank you to all those colleagues and friends whom supported us through their donations”, said Mr. Phil Murton. The money raised by Moontrekker so far has been earmarked for the following projects: One constructed standalone library in Laos, plus 7 classroom libraries in each of following countries; Bangladesh, Cambodia, India, Laos (another classroom library in addition to the constructed standalone library), Nepal, Sri Lanka and Vietnam. Royale International Group is one of the largest independent express companies in Asia and has been providing customized global express solutions to clients worldwide since 1980. We have offices around the world to ensure maximum efficiency and accessibility with our regional headquarters in Hong Kong. Royale International Group assists companies to improve their supply chain management by offering an in depth global knowledge and a 24/7 philosophy. Notice: The European Parliament (EP) and the council of EP have adopted a new regulation, Regulation (EU) No 955/2011 on repeal the current proof of origin requirement for textiles and clothing (T&C) products imported into the EU from 24 October 2011. And this new regulation will replace the (EU) No1541/98. As per the new regulation, EU will no longer be subject to the proof of origin requirement in the form of certificate of origin or origin declaration on commercial invoices. Traders are reminded that EU still requires the indication of the country /place of origin of imported products in the customs declaration. Such indication is subject to the EU’s normal verification procedures, which include the possibility for the customs, authorities to require additional proof, where appropriate, on a case-by-case basis. Please feel free to contact your local Royale CS or Sales Representative for more details. Shenzhen, 20th September 2011 – The Royale International Group, one of the largest independent courier company in Asia Pacific, is pleased to announce the opening of several new offices and warehouses across China. The opening of these new offices and warehouses will strengthen the Royale International Group’s already strong position in this important market and enable the business to work even more closely with valued customers in China. The offices and warehouses, located in the Beijing, Foshan, Fuzhou, Guangzhou, Shanghai and Shantou, will help the China team builds upon the company’s regional presence in mainland China. Although the Chennai customs has allowed import and export of courier parcels as personal baggage of couriers onboard flights from August 1 at the Chennai airport, not many businesses seem to be taking advantage of the scheme. Royale Asia Couriers (India), an associate of the Hong Kong-based Royale Asia Group, has launched the (on board courier) OBC/hand carry service from and to India, according to its Managing Director, Mr Prem Kumar. Moving documents and components from Chennai to other parts of the world by courier has become faster as the airport has allowed air courier companies to send consignments through personal carriers. Beginning at midnight, August 29, the China Civil Aviation authority surprised many travelers by raising its security standard to level 2 at Shanghai and Beijing airports. This means passengers face higher chances of being asked to remove shoes and belts. At least 50 percent of passengers will be asked to open their carry-on bags for thorough searches. Similar security measures were carried out during the 2008 Olympic Games in Beijing and the 2010 World Expo in Shanghai. The China Civil Aviation did not publicly announce the security upgrade. The stiffer checks created immense queues of unprepared passengers outside checkpoints at Beijing Capital International Airport. The CAA has not given any reason for the sudden change in protocol. Whilst regular courier shipments will remain unaffected, handcarry or onboard courier shipments departing from these ports will be subject to the same scrutiny. Handcarry clients are therefore advise to take note of the current situation and allow for additional time at check in. Our handcarry team will of course take this in to account and notify clients at the quotation stage on suitable flight schedules. Please be informed that the Universiade 2011 will be held in Shenzhen, China from 12th August to 23rd August, 2011. The Shenzhen government has issued public holiday arrangements for this event (August 12-23, 2011), which applies to all governmental departments and institutions, schools and non-government organizations in Shenzhen. There will be significant traffic control at different areas in Shenzhen city to ensure the smooth running of the event from the 9th August till the end of the Universiade. Royale China will be operating as normal during the whole period, we will try our best to ensure all pickups and deliveries are completed as required, but with the advent of such event, there might be possible delays beyond our control. If you have any specific special requirements or queries, please do not hesitate to contact Royale China. 14 June 2011 – The Royale International Group, the largest independent courier company in Asia Pacific, announced the opening of two new additions to their China offices in Chengdu and Dalian. The opening of the additional offices is the most recent in a series of business development efforts in China by the Royale International Group. May the 13th marks the return of the annual Hong Kong Soccer 7’s tournament to the territory with teams from across the globe flying in to compete in one of the most exciting football tournaments in Asia (www.hksoccersevens.com) Following their debut appearance in last year’s tournament, two time European cup champions, Nottingham Forest FC, return and once again team up with Royale Asia to compete against the likes AC Milan, KFC Tokyo and the Citibank All Stars in what will surely be a mouth watering weekend of football. Aside from the competition the Nottingham Forest Mobsters will be holding two coaching sessions during their visit. The first of which will be held on May 10th in Discovery Bay to coach up to 100 kids aged 8-12 who belong to the Discovery Bay Dragons. Photo sessions and autograph signings will also take place. The following day will see a coaching session for those involved in Operation Breakthrough which supports disadvantaged teenagers in Hong Kong. Once again, the former stars will run coaching sessions that will surely be enjoyable and memorable to all involved. We look forward to a successful week ahead with the Nottingham Forest Mobsters and hopefully some silverware to crown the visit! Shanghai, China, 27 April 2011 - Royale International Freight Forwarding Agency (Shenzhen) Ltd announced the opening of their new warehouse in Shanghai Hongqiao in May, 2011. The Hongqiao warehouse is located in Workshop Tier 1, 5/F, 98 Beishen Road, Minhang Area, Shanghai, and it is close to Shanghai Hongqiao International airport which can speed up the transit time. The Shanghai warehouse was established to further cater to their businesses in Northern China. HONG KONG-(April 26, 2011) - Die Royale International Group, einer der größten unabhängigen Kurier-Dienstleister in der Region Asien/Pazifik, gab heute die offizielle Eröffnung von zwei Niederlassungen in Düsseldorf und Frankfurt bekannt. Die mit Nachdruck betriebene internationale Expansion des Unternehmens ist eine Reaktion auf die wachsende Nachfrage nach den globalen Kurierdiensten der Royale International Group. Die neuen Niederlassungen ermöglichen eine Ausweitung des europäischen Kundenportfolios der Royale International Group und verbessern das Serviceangebot für bereits vorhandene Kunden. Aufgrund der europaweit rapide wachsenden Nachfrage nach Kurierlösungen erwartet man, dass Royale Germany eine immer bedeutendere Rolle darin spielen wird, Kunden bei der Optimierung der Leistungsfähigkeit ihrer Logistikinfrastruktur zu unterstützen. "Der Kuriermarkt in Europa und die zugrundeliegende Infrastruktur wachsen unglaublich schnell. Dies stellt eine großartige strategische Chance für die Royale International Group dar", betonte Dean Locke, Geschäftsführer der Royale International Group. "Wenn man unseren aktuellen Kundenstamm und unsere Zusammenarbeit mit europäischen Partnern betrachtet, ist es nur ein logischer Schritt für uns, hier weitere Auslandsniederlassungen zu eröffnen. Der Markt ist bereit dafür, dass Royale Germany auf bestehenden Beziehungen aufbaut und neue Geschäftsmöglichkeiten erschließt." Für weiterführende Informationen über die Royale Germany International Couriers GmbH kontaktieren Sie bitte unsere lokalen Vertriebsmitarbeiter oder besuchen Sie www.royalegermany.com. Die Royale International Group ist eines der größten unabhängigen Expressunternehmen in Asien und bietet Kunden weltweit seit 1980 kundenspezifisch angepasste Expresslösungen. Das Unternehmen mit Hauptsitz in Hongkong ist weltweit mit Niederlassungen vertreten, um maximale Effizienz und Erreichbarkeit zu garantieren. Durch fundiertes Know-how und eine "Rund um die Uhr"-Philosophie unterstützt die Royale International Group Unternehmen bei der Verbesserung ihres Supply Chain Managements. 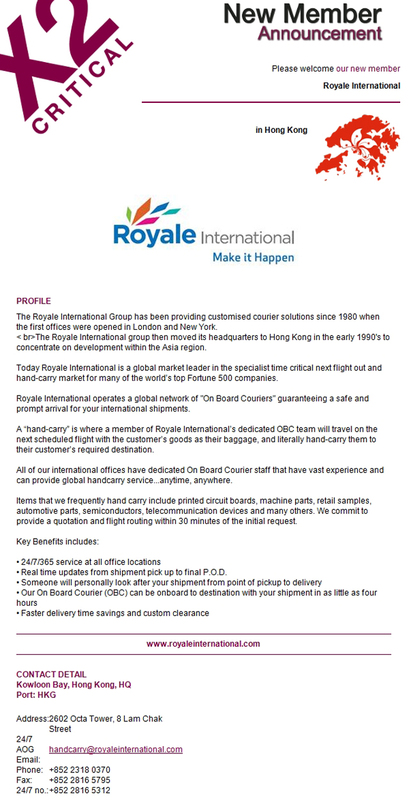 Shenzhen, China - The Royale International Group, the largest independent courier company in Asia Pacific, is planning on opening new operating subsidiaries in China to support their China expansion plans. The Royale International Group is looking to capitalize on a growth in emerging China economies with particular attention to the Southern and Northern China markets. The company is seeking to enhance and build upon its core client base in China and to increase its presence in China. Mr. Spencer Lam, Royale's China Market General Manager, comments: “it is our goal to become a well established organization in the global courier markets and the new offices in China supports our commitment to continued global expansion.” The opening of the additional China offices and warehouse facilities is the most recent in a series of international business development efforts by Royale International Group. Over the next six to eight months, the company will open new offices in Fuzhou, Chaozhou, Chengdu, Dalian and new warehouse facilities in Guangzhou, Xiamen, Beijing and Hangzhou to demonstrate its commitment to the rapidly growing clients in Asia. For more information, please contact us at our China Local Hotline: 4008 200 388 (Northern China) or at 4008 871 871 (Southern China). Cebu, Philippines – 04 March 2011 – Royale Asia, one of asia pacific’s leading independent courier & logistics, continues to expand with today’s opening of a new office in Cebu. The primary role of the new office is to expand on the existing Royale Asia business and presence in the Philippines, providing a much greater level of local sales and support for Philippines-based customers. The company already has an office in Manila. The new office is located on the Jegma Construction Bldg., National Highway, Pusok, Lapulapu City will accommodate the company’s expanding courier & logistics services. “Substantial time and effort has gone into selecting the new location and making sure the opening of our new office reinforces our aim to provide our customers with a true 24/7 presence”, says Scott Morson, Regional General Manager of the Royale Asia Group. For further information please contact Phillips Lorena, Cebu Royale Asia’s Branch Manager at tel: +63 32 495 8062 /mobile: + 63 9494234349 or visit www.royaleasia.com. Royale International Group is one of the largest independent express companies in Asia and has been providing customized global express solutions to clients worldwide since 1980. We have offices around the world to ensure maximum efficiency and accessibility with our regional headquarters in Hong Kong. Royale International Courier Group assists companies to improve their supply chain management by offering an in depth global knowledge and a 24/7 philosophy. Humen, Dongguan – 30 March 2011 - Royale International Freight Forwarding Agency (Shenzhen) Ltd, Dongguan announced the relocation of their office from Humen to Nancheng in downtown Dongguan on 01 April 2011, in response to their tremendous growth this past year. All office operations will resume normal during the relocation process. As of 1st January 2011, Royale International Freight Forwarding Agency (Shenzhen) Ltd will include an additional Residence Delivery Fee (RMB100 per air waybill (AWB)) for all China shipments to France. Due to the further expansion, please be informed that we will move our Guangzhou office to the following new address in Tian He Dong Road effective immediately. Please note: The Royale International Freight Forwarding Agency (Shenzhen) Ltd - Guangzhou office will continue to operate under normal business hours during the relocation. All contact numbers (telephone and fax) will remain unchanged. In view of the potential threat of lithium batteries to aviation safety, Royale Asia Couriers would like to remind all clients that lithium batteries, are not permitted to be shipped as checked in passenger baggage. Royale Asia Couriers will strictly enforce this rule and exercise stringent shipment inspections to prevent hidden dangerous goods from being shipped in accordance with the Hong Kong Civil Aviation Department directive and any such shipments will be returned to shippers. Should there be the requirements to ship lithium batteries Royale Asia will work with all shippers to provide an alternate solution. For more information, click here to read the Hong Kong Civil Aviation Department document. Customers are reminded to declare shipments at true and correct values on shipment invoices. Failure to do so may result in customs holds, inspections and subsequent fines if they deem values to be unrealistically low. Royale urges customers to adhere to this notification closely. If customers are unsure on any point regarding what values to declare they can contact their Sales Representative at Royale to clarify. Please note that any fines imposed for false declarations will be billed back to shippers. Qingdao, China, 4 January 2011 - Royale International Freight Forwarding Agency (Shenzhen) Ltd. announced the opening of their new office in Qingdao today, located in Times Square, Qingdao City. The Qingdao branch was established to further cater to their businesses in Northern China. The Royale International Courier Group is one of the largest independent logistic courier company in Asia Pacific with over 32 offices worldwide and aids some of the largest fortune 500 companies. Under Europe’s Community Customs Code a new Import Control System (ICS) will come into effect on January 1st, 2011 within the EU (and also Switzerland and Norway). ICS is an electronic security management system which enables customs authorities to assess the security risk on imports by analysing electronic data prior to the physical arrival of the shipment. This new regulation applies to all modes of transport (air, road, sea, and rail) and will apply to all shipments originating outside of the 27 EU member states plus Switzerland and Norway. Royale Asia will ensure all such data is transferred to the relevant authorities in the required timeframes and not require any additional data input from our customers. The new system may initially result in more frequent security checks as customs authorities are currently operating on high alert levels but we have taken all the required steps to ensure a smooth transition. Royale Asia was proud sponsor of the recent Tenerife 7’s Football Tournament held in the Canary Islands, Spain from November 19-21, 2010. The tournament boasts a wealth of ex-Premiership stars and Royale Asia also had 3 players make appearances in the form of John Fawcett, Dean Locke and Phil Murton who played alongside Jim Magilton, Nigel Jemson, Nicky Summerbee and Chris Makin. We look forward to supporting this great event in years to come. For more information, please visit Soccer Experience. South Africa 1 December 2010 – Royale International (previously known as the South African Courier Systems ), a subsidiary of the Royale Asia Group has re-branded itself to reflect the changing demand for its service and customer. The new visual identity and corporate website have just been launched to incorporate elements to strengthen, and modernise how it represents its worldwide network and services to its customers. The new corporate identity can be found at www.royaleafrica.com. Andy Smallman, Royale International South Africa Director, stated, "We underwent a significant process in an effort to fine tune our brand. I truly believe our new image represents the pillars of the Royale Asia Group’s brand. " “ We believe that the new name will better reflect the connection with the Royale Asia Group. The emphasis on a new brand reflects Royale Asia Group's desire for a more unified representation across its global network.” said Scott Morson, Regional General Manager. Royale Asia Group is one of the largest independent express companies in Asia and has been providing customized global express solutions to clients worldwide since 1980. We have offices around the world to ensure maximum efficiency and accessibility with our regional headquarters in Hong Kong. Royale Asia assists companies to improve their supply chain management by offering an in depth global knowledge and a 24/7 philosophy. Established in South Africa in 1995, Royale International have a world wide reputation for being fast, reliable and cost effective. We have the ability to handle urgent and time sensitive shipments, and manage any specific logistics requirement you may have. Royale International’s specialty is an overnight delivery service to most major cities from Cape Town, Johannesburg and Durban. 1. When sending samples shipments, all samples must include a “SAMPLE INVOICE” and all samples must be MUTILATED. a. For garment samples- a 26mm diameter cut hole or a 51 mm (length) tear has to be visible on the sample garment. The word “SAMPLE” must be marked on the outside of the sample in a prominent position. c. For other items (belts, bags, wallets, toys, etc) - a sample chop “INDELIBLY” must be marked on them. You will need to include that “All Samples are marked with Sample Chop” on your invoice. The above guidelines were provided by the South African Customs for the purpose of smooth clearance. If Mutilation upon importation is not done, or excess goods are found in the shipment, or contents found in the shipment do not match with the invoice, penalty will be issued. Copyright © 2019 Royale International. All rights reserved.